Blue Belle was excited to see a box arrive at the door. She always thinks all boxes coming to our door are for her. This time she was correct. We received a box from Chewy.com. 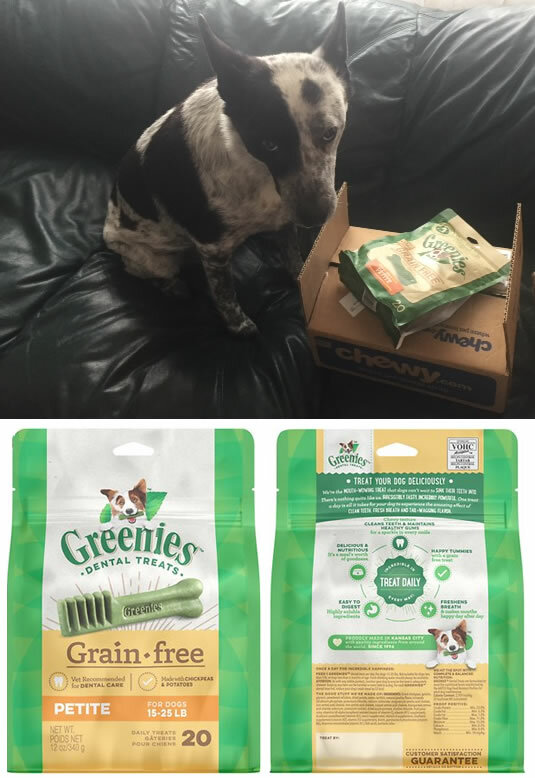 The product for our review was a new product, Grain Free Greenies. The 12 oz. bag of petite greenies was not exactly what I requested. The petite greenies are treats for 15 – 25 lb. dogs. Blue Belle is closer to 50 lbs. So, basically one treat is gobbled up in less than a minute. We have always liked Greenies, but I wanted to test this new grain free type of Greenies because Blue Belle has had digestive problems for several months and after various attempts to figure out what we needed to change in her diet, we decided to place her on grain free food and that has been a great solution. We do like the Grain Free Greenies, I think next time I will get the regular size. Greenies dental chews are good for oral health. We do recommend Greenies, but as the product packaging says “As with any edible product, monitor your dog to ensure the treat is adequately chewed. Gulping any item can be harmful or even fatal to a dog.” Oh no! 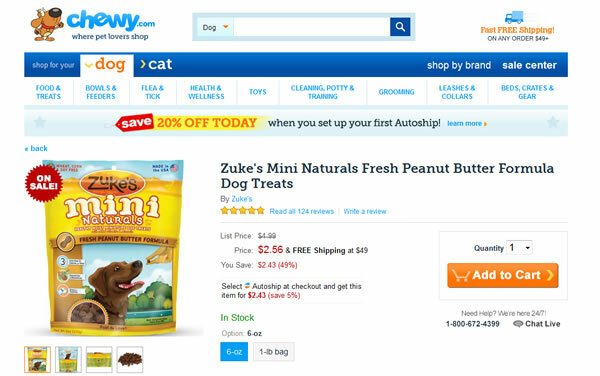 I don’t want to freak out our readers, it is true that we want to make sure our dogs are safely ingesting everything they eat, including treats. I will make sure Blue Belle chews adequately. We received a 2 oz. 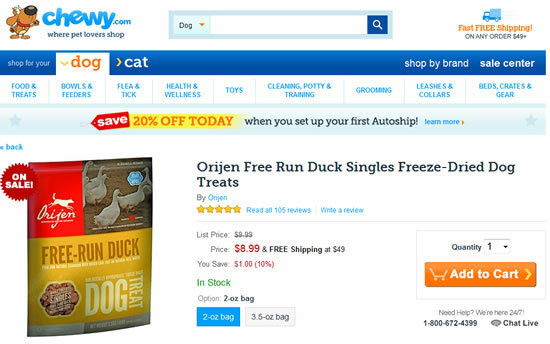 package (approximately 55 treats) of freeze dried dog treats made from duck and duck liver. The treats are proudly made in Canada. The package indicates they use regional ingredients delivered fresh. The founder says the quality is never outsourced, preparing Orijen treats in their own kitchens, where they freeze-dry fresh local ingredients and control every detail of preparation. They are freeze-dried to lock in flavor and nutrition. The first thing I noticed about the treats is the fact that they are very light in weight. The first thing my granddaughter noticed, is the smell. But Blue Belle loved the smell. 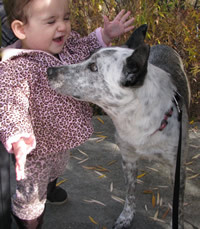 We are very careful to feed our special loved one only the best dog food and treats. This product by Orijen qualifies as a healthy good snack which we feel we can trust. EXCTITING NEWS: Use this promo code BESTDOG20, it gives customers 20% off their first box $25 or more. 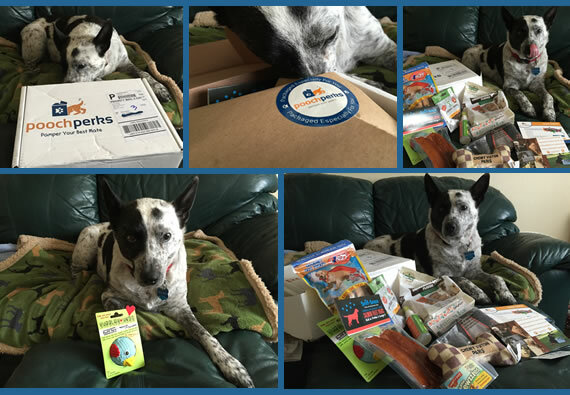 We were told to expect a box for our canine contributor, Blue Belle, to review. She was so excited. Oh my goodness. What an awesome box full of treats and toys. PoochPerks is a monthly box subscription service for your four legged family members which include a unique collection of organic treats and interactive toys. 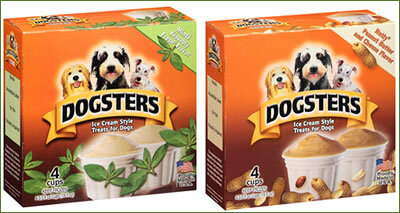 Their treats are gluten free, have no artificial preservatives and are made with natural ingredients. Their toys are tested for durability and safety. They give preference to local batch gourmet and socially aware companies. (Blue Belle, Murry and Julie really like that fact). Blue Belle absolutely loved the box full of treats and toys. One of her favorite toys is a little rubber toy from HuggleHounds. Stuffed Ruff-Tex is 100% natural rubber that is stuffed and extremely flexible. We use it to play a game with her. We put the toy on her head and tell her to wait and then when we say “OK”, she throws the ball off her head and catches it. SUCH FUN! We highly recommend this subscription box full of goodies. You can purchase a subscription for your pooch, or a gift for a doggie friend. If you choose to cancel your subscription, I see that you can go to the contact page and submit a request to cancel. Contains 2 to 3 packages of all natural, made in the USA treats. That takes you to the cart, select the quantity and don’t forget to add our coupon code to get 20% off your first box of $25 or more.